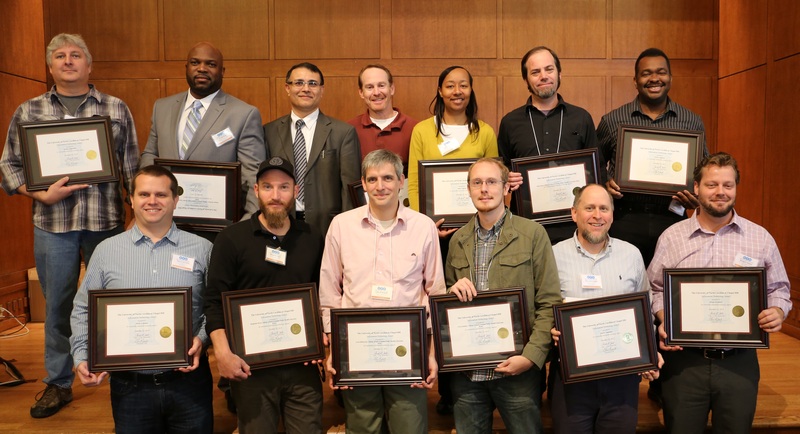 The 2015 IT Award winners, who were announced last week at the CTC Retreat, left to right, on the front row are Patrick Murphy, Benjamin Davis, Lewis Binkowski, Corey Sanders, Paul Lamontagne and Morgon Haskell. On the back row, left to right, are Ashley Willis, Onegaa McGhee, Lakheshn Khullar, Zeno Pfau, Janae Simons, Thomas Laney and Victor Anderson. Winners of IT awards who are not in the photograph are Stephen Joyce, Di Liang, William Tyler Niggel and Blair Mason. Congrats to all the winners and nominees! Thanks for all your hard work and dedication.